Gassing Up for Summer! — welcome to the Good Sport! 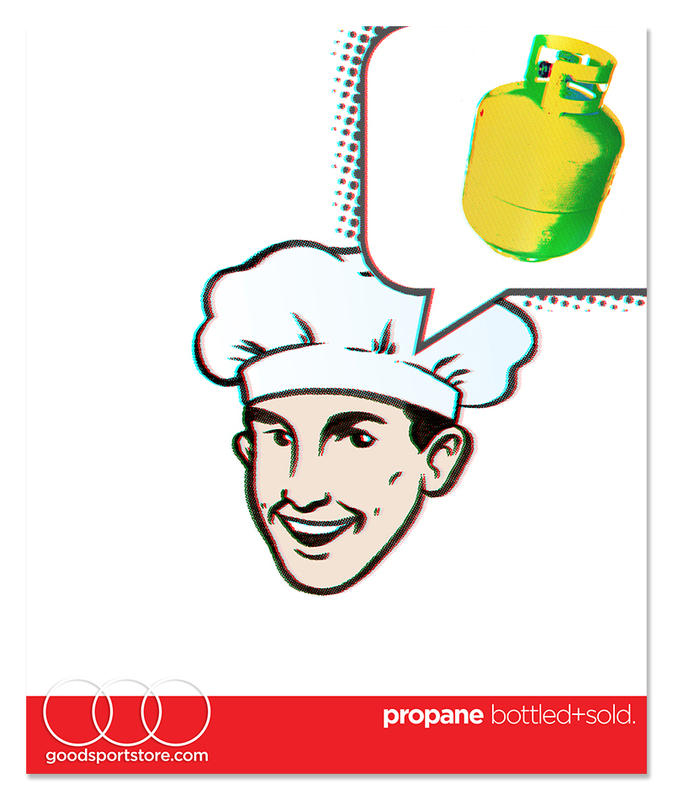 Since 2013, we have made it our responsibility to alert all Americans to the impending embarrassment associated with a propane grill that fizzles out. Here are a few of our public service announcements all designed with you and your backyard cooking sanctuary in mind! 2013: Multi-layered approach designed to instill fear and unrest. Some blame this campaign for pushing holiday picnickers away from heat receptive foods and back to cold sandwiches and salads. 2013: Simple iconography and graphics embrace a more "Gestalt-friendly" approach. 2014: Acronym-centric approach is emphasizing clean and friendly service. 2015: An ADHD-friendly approach for multi-tasking backyard "Masters of the Grill." 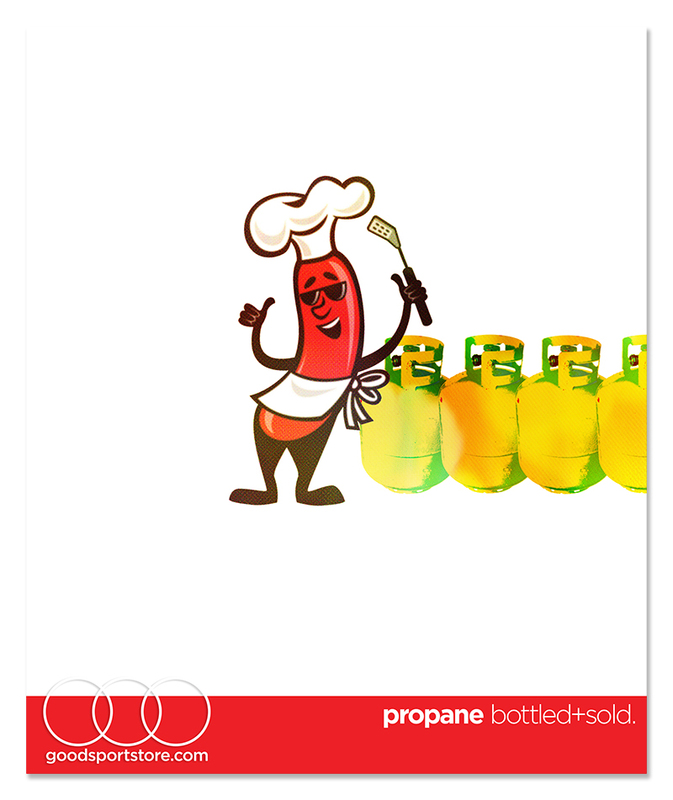 2015: A more comprehensive approach capitalizing on the international hand gesture that demonstrates an appreciation for those well-prepared for the summer cooking season by filling multiple tanks. 2015: Attempting to encourage a younger audience of future "Grill-Masters," the "Weiner Chef" was introduced. Despite the positive response from multiple focus groups, many felt that the tubular processed meat product was too closely linked (get it!) to charcoal-centric grilling. 2017: To capitalize on the pro-American BBQ fervor rapidly overtaking backyard cooking facilities, The Good Sport introduced a patriotic-themed message designed to drive backyard cooks away from their charcoal grills (choke, choke, cough, cough) and back to clean-burning propane! Should your tank be "Jackson Browne-ing" it (running on empty), please stop by our Chief Justice Cushing Highway home and we will "fill her up!" Have a Great Summer Season! See you soon!